Essence stay with me longlasting lipgloss in #07 Kiss Kiss Kiss - I previously got two bright and fun shades from my Italian swap, so I asked for more! It is very creamy, smells pleasantly of sweet berries, wears comfortably and fades beautifully. The shade is a medium red with an almost neutral undertone. I may do a comparison or lip swatch of these "stay with me" glosses if any of you request! Essence mini lipgloss set in #04 London Calling - there are 3 shades in the set. a clear sparkly one with pale pink and baby blue iridescent. a coral-ish baby pink. and a slightly mauve-y rose pink shade. the textures are similar to the longlasting lipglosses, but more sticky. also has a cherry scent instead of a sweet berry one. Catrice Made to Stay Longlasting Eyeshadow #040 Lord of The Blings - Catrice makes really really good make up. This is like a benefit creaseless cream shadow or perhaps a mac paintpot, only shinier and much cheaper. Lord of the Blings is a brilliant neutral taupe. High Shine. Catrice Ultimate Nail Lacquer in #260 Blue's Brother - Haven't tried yet. Catrice Million Styles Effect Top Coat in #C05 Return of Space Cowboys - very interesting! i just painted a coat of this over my bright red nails and it turns the red into a purplish bluish poisonous shade. I will try to do some NOTD or nail swatches later! Catrice Absolute Eye Colour in #400 My First Copperware Party - smooth, satin, sheen finish. very soft and blendable. colour swatched below. This is a dark brown with a hint of red. INGLOT!!!!!!!!!!! I have wanted to try Inglot for EVER and never had the chance to. Thank you again to @hdbeauty to purchase these for me!!!!!! Inglot Sleeks Cream Lip Paint in #108 - a very pretty girly pink. medium to deep, bright. the texture is so creamy and thick, like a liquid lipstick (it is lip paint, not gloss). pigmented. tastes of sweet vanilla. swatched above with the other lipglosses. Inglot Freedom System Eyeshadow in #Pearl 399 - a medium cool-toned pink, silvery pearl finish. Inglot Freedom System Eyeshadow in #Pearl 423 - medium to dark brown, also peraly satiny finish. has more purple than the Catrice My First Copperware Party. below are all the 5 eyeshadows swatched next to one another. the top row is primed with the essence eyeshadow base, the middle row is primed with catrice cream shadow lord of the blings, the bottom row is my bare skin. the five shadow from left are catrice my first copperware party, catrice c'mon chameleon, inglot matte 342, inglot pearl 399, and inglot pearl 423. Then there are some extras including a marshmallow (consumed before I manage to picture properly, but it is on instagram...), perfume samples, skin care samples, a pair of earrings, and the makeup pouch you see in the beginning of this post. Rochas Paris Les Cascades de Rochas Eclat d'Agrumes Eau de Toilette (samples *2) - fresh, very easy to wear. Montagne Jeunesse Fresas Con Nata Mask - this could be the strawberry souffle, or the strawberry and cream 'gel' mask. I don't know :P But excited to try this soon too! this mini sachet is the perfect size! the usual Montagne Jeunesse masks are too big for 1 application! Inglot Under Makeup Base - face primer. will see how good it is! If you haven't already, please go join my Blogust Giveaway. I will be getting the prizes ready and announce that soon. If there are more participants, there will be more prizes! otherwise, you can also google 'ombre' or 'gradient' nails. there are tons of pic-torials or youtube! Hi Lubka, it really depends. 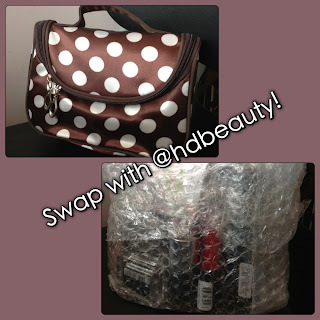 For each swap we can set a different budget, and specific items, and used or new products. :) usually we discussed over email and then confirm. I have done a few swaps before and all are different 'rules'!